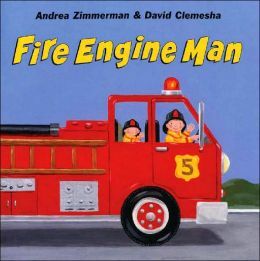 Today we read the picture book “Dot the Fire Dog”, and other stories about the work firefighters do. Lay right thumb on left palm. And plans to sleep that way all night. Yawn, close eyes, motion going to sleep. Right hand slides down left arm, gripping wrist to elbow. Then he JUMPS in his fire truck to GO, GO, GO! Pretend to drive, steering fast. Until they see a fire on top of the hill! Number one rings the bell, ding-dong. Number 2 pulls his big boots on. Number 3 climbs on the truck right away. Number 4 joins him, no one can wait. Number 5 drives the truck to the fire. The big yellow flames go higher and higher. Our art project was inspired by “Dot the Fire Dog”. I had kids create their own dalmation picture by using a template (which can be found by clicking here)and making fingerprint “dots” on the dog with black watercolor. A few got creative and used the entire pallette for their spots. They also collaged on a fire hat, and colored in a background with markers.